Two more smart contact lenses, for presbyopia and cataract surgery recovery, are still in the works. Four years after announcing an ambitious — and often ridiculed — project to create a glucose-sensing contact lens along with Novartis subsidiary Alcon, Alphabet's Verily is throwing in the towel, the company announced in a blog post today. It will continue to work on two other medical contact lens projects, aimed at presbyopia and cataract surgery recovery. "Our clinical work on the glucose-sensing lens demonstrated that there was insufficient consistency in our measurements of the correlation between tear glucose and blood glucose concentrations to support the requirements of a medical device," Verily CTO Brian Otis wrote. "In part, this was associated with the challenges of obtaining reliable tear glucose readings in the complex on-eye environment. For example, we found that interference from biomolecules in tears resulted in challenges in obtaining accurate glucose readings from the small quantities of glucose in the tear film. In addition, our clinical studies have demonstrated challenges in achieving the steady state conditions necessary for reliable tear glucose readings. We are at a point where we have decided, together with Alcon, to put the glucose-sensing lens work on hold, while continuing to focus on the smart accommodating contact lens and smart intraocular lens projects." The glucose-sensing contact lens was one of the first projects that Verily announced, before the division even had the name Verily. While the project generated a lot of excitement, it was also met with quite a bit of skepticism from the diabetes community. Shortly after the announcement, a number of innovators in the space told MobiHealthNews they felt the technology was unrealistic (one called it "a science project," citing some of the same issues that Verily mentioned in its blog post. And interim signs haven't been any more encouraging: the company had already started to backtrack some of its early timeline projections in 2016. As something of a flagship project, this failure is a bad look for Verily, which has faced its share of criticism for proposing ambitious project, but not delivering much in the way of results. But as Otis points out in the blog post, the project has created a lot of learnings that may yet fuel the other two contact lens projects. He also noted that Verily isn't giving up on its other diabetes efforts. "We remain committed to improving the lives of people with diabetes including through improved methods for inexpensive and unobtrusive glucose sensing to support diabetes management," he wrote. "We are working closely with Dexcom to develop miniaturized continuous glucose monitors and with Onduo, our joint venture with Sanofi, to integrate continuous sensing into the care paradigm for people living with Type 2 diabetes." 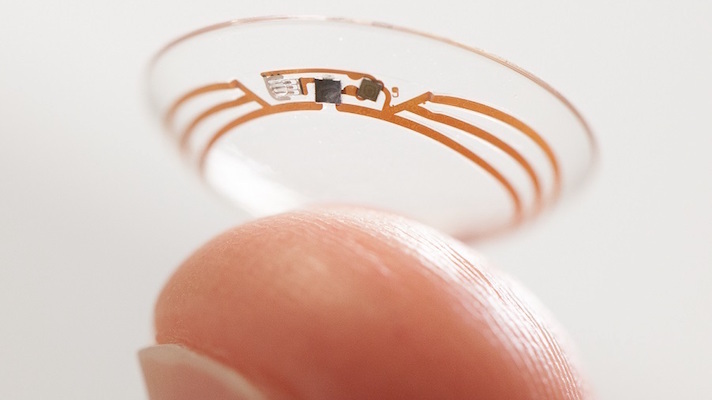 This is the end of a long road for Google's dreams of a glucose-sensing contact lens, but not necessarily the end of efforts to create such a product. A startup called Medella Health, founded by Thiel Fellow Harry Gandhi, is still working on the tech, though the company has been largely silent since its 2016 funding round. At that time, Gandhi told MobiHealthNews that it will integrate a small sensor, a chip, and a micro-antenna and it will transmit glucose readings to a mobile device, enabling the user to track their glucose in near-real time. He claimed Medella was ahead of Verily's team on the sensing technology, but behind on the micro-electronics. Another startup, Netherlands-based Noviosense, is working on a tear-based sensor, though its offering is not a contact lens — it sits in the lower eyelid. Additionally, at the beginning of this year a team of South Korean researchers touted a smart, glucose-sensing contact lens in a paper in Science Advances. The team described soft lenses carrying a tiny LED light that automatically turns off in the event of high glucose levels, as well as their efforts to test the lens in vivo.